The room 7 of the Uffizi Gallery houses the famous masterpiece by Gentile da Fabriano (ca 1370 - 1427), the Adoration of the Magi. The painting is a tempera and gold on panel, made in 1423. The work is considered one of the masterpieces of the International Gothic style. It was made for Palla Strozzi, one of the greatest humanists of fifteenth-century Florence. Palla Strozzi was also remarkably rich. During the 15th century, the theme of the Adoration of the Magi allowed the artists to represent the richness and culture of their clients. At the same time, the presence of numerous details gave to the artists the opportunity to show off their craftsmanship. 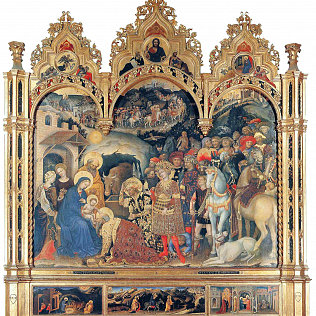 In the Adoration of the Magi, the atmosphere is fabulous, elegant, typical of the International Gothic style. In the work there is not a single focus of attention, but the observer must dwell on various scenes. The Magi are depicted in the course of their journey, until the arrival of Jesus and the adoration. The use of gold - applied in thin leaves, then carved freehand - makes the work rich and bright. The frame is also rich and various: it gives to the work a special shape, that makes it unique. The painting is located at the Uffizi Gallery since 1919 and it was restored in 2004.